Haven’t decided on a hotel yet? You can look at other available hotels in the Ile de France with Booking.com. Since Roman times the Ile de France has served as the heart of this great country: its wheat fields, forests, and gardens an inspiration to its painters; its monumental châteaux a testament to the power of kings and emperors, and the great city of Paris—as timeless as love and light. 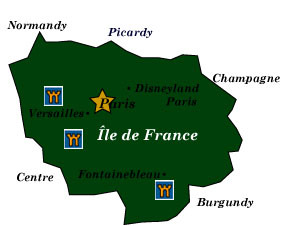 Most visitors who come to France will pass through the Ile de France in some manner, whether by plane, train, or car. There are two ways to get the most out of the region: stay in Paris and make easy day trips outside the city, or rent a car (if you haven’t your own) and take your time exploring the glorious palaces, charming villages, and delightful gardens, while making a fantastic castle hotel your home for the night. Château de Versailles Opulent and sumptuous, Versailles was the ultimate royal residence and court of Louis XIV. The king gave carte blanche to the greatest architects and landscapers (and some 30,000 workers) of the 17th century to build a palace with an unprecedented scale of luxury. Of course such an over-the-top lifestyle came to a crashing end during the French Revolution when it was abandoned, its furnishings sold and artworks removed. It’s a breathtaking place to visit today, and one of France’s most popular attractions. Château de Fontainebleau With origins back to the 10th century, this former hunting lodge deep in the forest of Fontainebleau found new life in the 16th century under François I, who imported Italian artisans to design a magnificent château. Several French kings were born and died here as well. Fontainebleau was where the Edict of Nantes (which had given rights to the Protestants) was revoked in 1685 and where Napoleon abdicated as Emperor of France in 1814. Although most people come here to visit the château, take time to explore the Fôret de Fontainebleau and its lovely walking trails that wind through the forest. Château de Rambouillet When the president of France is not in residence, you may visit this 18th-century royal palace. All that remains of a 14th-century fortified castle that once stood on this spot is the tower named after King François I who died here. For those who prefer natural attractions, the Forest of Rambouillet makes for a lovely outing for hikers and bikers who can explore valleys, deep woods, ponds and waterfalls with plenty of wildlife about. Château de Vaux-le-Vicomte Built by Nicolas Fouquet, the finance minister of Louis XIV, this château was once considered the most glorious 17th-century château in France—until the jealous king arrested Fouquet, seized the castle, and employed its architects (including the great French landscape gardener Le Nôtre) to build the palace at Versailles. Try to visit on a Saturday from May to October when special candlelight tours take place. Château de Malmaison Empress Josephine, the first wife of Napoleon Bonaparte, established herself in this charming château to get away from the formality of Fontainebleau and the Tuileries. Josephine died here in 1814, surrounded by memorabilia of her former husband. In contrast to the crowds at nearby Versailles, you’ll appreciate this château’s peaceful surroundings. Basilique St-Denis Legend has it that after St. Denis was decapitated in 262, he picked up his head and walked here. With such a miracle in place, a church was built on the site. Closer to reality, this basilica was the world’s first Gothic structure. Most kings (all but three) of France are entombed here, as well as Clovis, king of the Franks, in 511. Although the kings of France were not crowned here, the queens were. Disneyland Resort Paris Disney fanatics, families, and the profoundly curious can immerse themselves in two theme parks—Disneyland Park, which is much like the original version in California, and Walt Disney Studios Park, which is a salute to the film industry. Rides galore, live entertainment, light shows, lines, and the requisite castle attract some 50 million visitors a year. But also do yourself a favor: you’re in France, so go visit a real castle. They’re everywhere! Chartres Glorious and divine no matter the faith of the visitor, the Cathédral Notre-Dame de Chartres attains perfection in its medieval architecture, sculpture, and exquisite stained glass. Built primarily in the 12th and 13th century, it has been a site of worship since before Gallo-Roman times. Chantilly An easy day trip from Paris, Chantilly draws visitors to its horse races and famous Renaissance château. Built around 1560, the Château de Chantilly was the seat of the head of the Bourbon-Condé dynasty. Louis XIV often came to visit. The Musée Vivant du Cheval is a museum devoted to everything about the horse. Giverny If you’re an Impressionist art devotee, a pilgrimage to visit the home and gardens of one of its greatest masters, Claude Monet, is a requirement. The house, now the Fondation Claude Monet, and its gardens are open to the public. No original art is here, but you’ll find plenty of inspiration in the gorgeous gardens at any season of the year. In town you’ll also find the Musée des Impressionismes, which features Impressionist art as well as temporary exhibits.